Hourglass Ambient Lighting Blush Palette - photos, swatches and review! Inside the plastic chrome packaging are three marbled blushes, ready to adorn one's cheeks. Two shades are already available to buy in single blushes, Luminous Flush, the pinky one and Mood Exposure, the browny plummy one. The shade in the middle, Incandescent Electra is new. It would've been nice to have a second new shade in the palette but seeing as I only own Dim Infusion and wear it almost daily, I was ready to hand over my cashola. And I've been coveting Mood Exposure for ages anyway. See how many justifications I have, I could list 'em all day! But let's get looking at swatches shall we? Each of the three blushes are smooth and soft without much fall out. They all give a soft and subtle glow to the skin while making you look airbrushed. I do like to look airbrushed in day to day life so I do. I love how travel friendly they are and while I don't do much actual travelling myself, I can pop it into my makeup bag safe in the knowledge that I can whip it out, lash it on and look gorgeous. And while you won't be swanning around the place taking photos of yourself in a big fancy camera, I did and they photograph beautifully, on my DSLR and on my iPhone. Now I'm not usually one for pinky blushes but Luminous Flush has converted me. It's a light rosy pink and combined with Luminous Light Ambient Lighting Powder, a champagne shade that brings light and radiance to my skin, I look positively flushed and candlelit. I can see me wearing this a lot in the spring especially or at work when I want to give my cheeks a hit of colour without going over the top. Incandescent Electra is described as a cool toned peach blush and was the least pigmented of the three when applied to my cheeks. I haven't played around with layering it yet but will try it out and let you know how I get on. But what I can tell you so far is that if you're pale and want a hint of colour and that lit from within glow to the skin, then Incandescent Electra is the one for you. It was hard to capture on camera how subtle the finish was on my skin but I love it and hope that as I make my way through it that the swatch on my arm above will translate to my cheeks! Oh Mood Exposure. You are everything I was expecting you to be and more! This browny plum shade is the perfect neutral blush which adds warmth to my complexion and makes me look a bit more healthy. I like to use it as a slight contour and blend it upwards, slimming down the aul cheeks a bit as I go. Happy days. Because I like to wear all the makeup and I'm a firm believer that more is more, I played around with the palette yesterday and applied Mood Exposure to contour a bit, blending upwards and then used Incandescent Electra on the top of my cheekbones to add a subtle highlight and even more warmth and glow. Love it. The palette is £56 on Space NK and I'll update the post when I get a price in euros. First impressions? Yeah, I feel bad for any other blushes in my collection because I can't see them getting a look in anytime soon. At the moment, the palette is limited edition, but hopefully they'll make it permanent the way they did with the Ambient Lighting Palette which will be mine very soon too. I'm an Hourglass obsessive and need it to add to my collection! 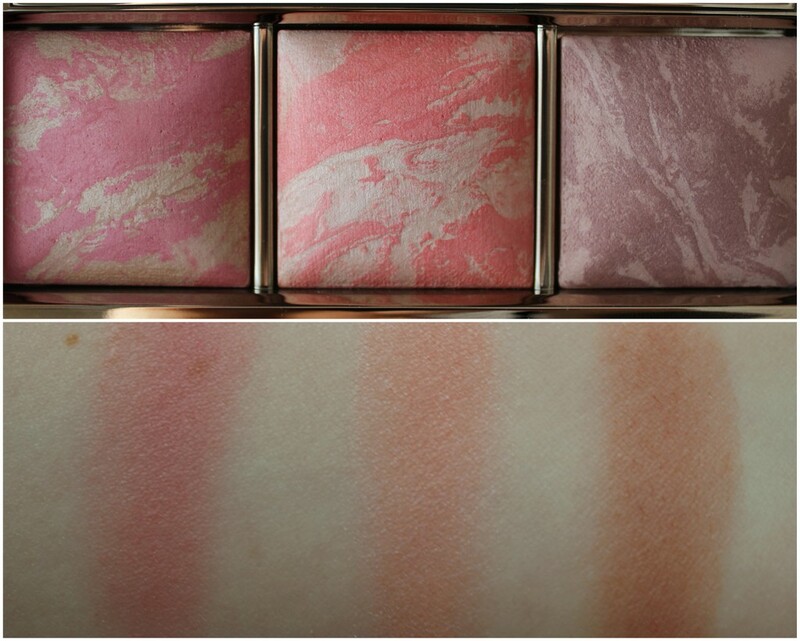 So do you think you'll be partaking in the Ambient Lighting Blush Palette? Christmas is coming up so self gifting is totally allowed! They're all gorgeous on you! I am still dithering over whether to get Mood Exposure. They all look fantastic on you!! I'm still stuck on whether to fork out for this as some girls didn't think they were worth the big bucks but I do love a pretty blush so think I may need to stick at least one of these on my Christmas list! If you had to choose one that's good for pale skin which would it be? I have been stalking this palette online for the last few months.... it is just beautiful.... but can I justify the price?! Its just as well you didn't justify the purchase or I would be on route to space nk already! Loving everything about this! I too enjoy looking airbrished day to day! Love the idea of layering up - that's the clincher for me, it MUST be mine now!